I was out back for several hours and got some good pictures. It’s crazy! I look up and one after another baby is on the porch and giving flying a go. Its absolutely great. The 6×6 compartment in the plastic barn is venturing out. They are at 30 days old and plenty ready. I think it’s great that they made it so long. 5 big fat babies in a tiny 6×6 compartment. The mom is looking ratty and is missing a large patch of feathers on the back of her neck. The compartment has a crescent opening so it may be from her habit of sitting in the door way; head out. Then as I was standing below the housing taking pictures I look down and there was a tiny Mockingbird nestling, begging for food. Its big pink mouth opening and waiting. I picked it up and put it back in its nest. Mom and her(?) 3 other nest mates, didn’t seem to miss her too much. I’ll have to keep my eye open on that one. That baby mockingbird would have been snake food for sure. Between the snakes, crows, hawks and the cats, it would not have made it through till tomorrow. Ugly little thing…but soooo cute. Total pandemonium! There is so much fighting going on that all I can do is laugh. No bird is really getting hurt but the birds that fledged in the last week are keeping all the parents still feeding nestlings, on their toes AND apparently, quite annoyed. The fledglings are finding it difficult to find their way back into the correct compartments. They seem intent on entering compartments that have nestlings inside. It really isn’t funny but all the yelling and screaming was so crazy…I guess that is all you can really do. It seems like quite a few are still returning to their old nest to sleep. Even some of the ASY birds are returning to the gourds that fledged the first batch of young. The sight of them though at sunset is amazing. I see them swirl and turn like the waves of a tide. Up flying out of sheer joy of flight. Singing and chortling to one another. Chasing and playing, it utterly amazes me. 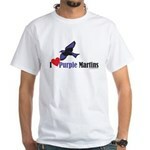 To all the people that have signed my guestbook at purplemartins-r-us.com, I thank you. I got a ton of emails and questions from the article that came out in the local Newspaper. I wish all of you well and I will be in touch with you all again. My babies will need somewhere to nest in the coming years! I did a nest check on the gourd rack today and it seems like my season is winding down. The last 14 fledgelings are still returning at sunset. But not all of them are sleeping in the housing. Right before the last birds turn in for the night a handful of birds fly to the north east. I presume to roost in trees. Several of the fledglings remain without their parents. I can tell because they are trying to sleep in a compartment that has nestlings and those parents are not too thrilled with the hitchhikers. Several beatings later they find other compartments to sleep in. There was one nest of 5 eggs that is due to hatch any-day and none have hatched yet. It is in the same gourd that had 6 abandoned eggs. I find it extremely unlikely that the gourd is cursed. No way that 2 different females in the same gourd were lost. So my new assumption is that the ASY male that has been protecting that gourd is sterile and his females are abandoning him. OK, I know that sounds a bit far fetched. Its either that OR I need to order some Holy water to take the Jinx off that gourd. On another note. On this Memorial Day (As a former United States Army Reservist) I would like to extend a huge debt of gratitude to all the Active Duty, Reservist and Gaurdsmen who protect our Country now and in the past. I salute you and God Bless you! Rain 3 days in a row…it’s a blessing! The martins are doing wonderfully. 2 of the last 3 nests that have fledged are still returning to the housing at night. After I physically removed a fledgling from a compartment with younger nestlings-I have not noticed any more of this type of shenanigans. 5 more nests are due to fledge on the 27 through the 30th. So a nest check needs to be done soon. Like tomorrow! I’ll need to bring some string so I can pull out the plug for the entrance. I leave them plugged for a minute after raising the house back up. As the one nest is pretty close and I wouldn’t want to scare them out prematurely. It has been too long since I did a check on the gourd rack. Between getting my website ready for the newspaper article, my youngest going to the ER (via AMBULANCE-he’s OK), and the rain…I have been a frazzled mess! I hope you check out the new link I put in the blog-roll. It takes you to the Palm Beach post video and article that they did on my site. Other than a terrible hair day caught on video, its pretty good. I have not been able to distinguish Beau around my colony. It’s a shame he wasn’t banded as research in rehabbed martins is so sparse. I still think about him and I have wondered if the occasional lone martin sleeping in his old gourd is him. I have seen either a HY, female or SY male sleeping in that gourd a few times. The grainy resolution of the black and white nest cam makes it impossible to determine exactly what age bird it is. Only that it is NOT all purple. Why do we call them purple martins? They are not purple. It drives me nuts. When I paint them I always get flustered getting the color right. I go for the deepest and richest of blues. It does seem confusing to paint a purple martin blue but in all the pictures I have taken, I still have not seen any purple. Now I am rambling. It’s almost midnight…so good night. The write up was nice. I never raised “golden” finches. They were Gouldian finches but hay, its a bird! And I don’t count wing feathers…in case you were wondering! There was a deluge of rain this afternoon. The wind swept sideways and knocked over patio furniture. The young Martins were trying to land in a large tree and surprisingly did not seek shelter in the housing. It has been so dry though that I wonder if the rain, harsh as it was, was a welcome sight. I hope we get a lot more but it was a wonderful respite to the dryness. See, prayers ARE answered! That was easy! Now, pray for World peace. What a crazy day!!! I DID get a nest check done though, 18 more fledged for a total to date of 34 Purple Martins added to the world! Very exciting. I had to remove one of the fledglings that had already fledged to its own nest as they keep invading a nest of younger birds to eat the food there mother brings for them. The little guy(gal?) promptly flew off. The drought is terrible though and I suspect that may have something to due with the youngsters parasitizing food from other nestlings. Very windy, smokey and the drought make for some very slim pickings. I placed more crushed egg shells and dried crickets in the platform feeder for the Martins. I have never seen them eat the dried crickets but they are fond of the egg shells. The recently fledged like to visit the feeder so they may actually eat some. Another nest is out and about! I was out with my 2 1/2 year old son. We were walking in the yard and I hear the alarm. Flying low WITHOUT any martin in his talons is a hawk flying away from the housing. Every Martin was in high alert mode. I have never seen so many calling in alarm so loudly; Even with the other attacks I have witnessed. I am sure it had to do with the 14 or so baby martins just learning to fly. All the birds were super vigilant and chased the hawk to a tree across the street. The screaming alerts continued for about 3 minutes until the hawk finally just flew off, in disgust down the street. The martins seemed to be particularly interested with a very high, sparse pine about 100 yards from the housing, in a neighbors yard. Maybe some are roosting there tonight. Another fledge day has come for 9 little martins. An unporched natural horizontal gourd and a 6×12 compartment in the S&K barn were the lucky winners of the day. The most comical part of fledge day (for me) is watching the parents try to round the babies up back into the proper room. Several of the babies found alternate sleeping arrangements in one of the empty gourds on the rack which has a porch. A few made it in the unporched gourd after a few failed attempts, with much wiggling and squirming. All in all, a wonderful day watching the fledglings take a turn flying about. No sign of Beau today, but then again it is very difficult to tell them apart. Actually none of the parents and fledglings came around today. There is a ton of smoke from brush fires in the area that made the air thick and hazy. I wonder if that decreases bugs and thus makes it harder to feed? The busiest activity was in the AM with several SY males laying claim to the now empty gourds that the babies fledged from. I see no new nesting and I think that’s about it as far my colony goes. Natural gourd #8 which had 3 eggs has hatched. The parents are busy with the ins and outs of feeding young. 2 gourds are ready to fledge and that will be the next buzz of activity. On a business note: I have done a few Purple Martin comic strips. I think they are funny…you be the judge. Check them out at the photo gallery. Click on the photos link to the right.